The World Cup is an advertising bonanza. These top players are the best at cashing in. Considered the best soccer player in the world these days, Christiano Ronaldo is also the most marketable "footballer" in the game. The Portuguese soccer star tops the list of the 10 most recognizable players in the world, according to a new ranking by sports marketing firm Repucom. The list comes days before the FIFA World Cup kicks off June 12 in Brazil. An estimated 3.2 billion people are expected to watch the month-long tournament, making the World Cup a bonanza for global advertisers. These are the players with the highest potential to land lucrative contracts with corporate sponsors such as Nike and Adidas. 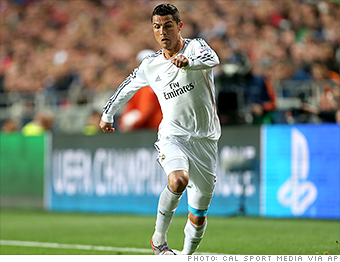 With 82 million Facebook likes and 26 million Twitter followers, Ronaldo is "an endorser's dream," said Repucom CEO Paul Smith. Ronaldo, captain of Spain's Real Madrid, has a deal with Nike (NKE) worth an estimated $9.5 million a year, along with sponsorships by Herbalife (HLF) and Yum! Brand's (YUM) KFC.